SMS Notifications are out-of-band text messages sent in response to events or transactions which occur somewhere else. While often used as a marketing tool to increase the percentage of returning visitors, SMS notifications are very useful for organization and public safety purposes as well. Because of the enviable open and interaction rates of text messages, using SMS as a delivery channel for notifications is a compelling option. Since SMSes work as a push to devices, you won't have to rely on people checking in on a site, app, dashboard or other channels to keep apprised of events, ETA updates, or changes to plans. Additionally, the out-of-band aspect of SMSes is essential for public safety purposes (e.g., police activity, fires, or natural disasters), as well as maintaining a backup channel in case primary means of communications fail. In marketing, SMS notifications increase the stickiness and interaction of your site for opted-in customers (local laws vary, check with your legal team about your local opt-in regulations). Whether notifying people of sales and providing coupons, keeping the conversation going on social networks, or directing people to a retail store, SMS notifications are the secret weapon for your business's engagement. SMS Notifications also have a pivotal role in logistics. Whether sending event updates, keeping people apprised of schedule (or even providing support) at live events, or for notifying the proper teams when bad things occur, SMS is a great channel to tie everything together. Use SMS Notifications to keep things running smoothly on the day of the show, fight exceptions, and avoid those logistical nightmares you're dreading. Twilio has quite a few products that ease or automatically provide SMS Notifications for events or transactions. Twilio's Notify product has the SMS channel built in, and can also push notifications to smartphones and browsers as well as messaging apps. See more of the ways Notify is employed. Alternatively, Programmable SMS allows you to roll your own notifications using SMS as the delivery channel. We have some examples on our documentation site showing how to use it for server exception notifications, ETA Notifications, and marketing notifications. As always with Twilio, ease of use is paramount. 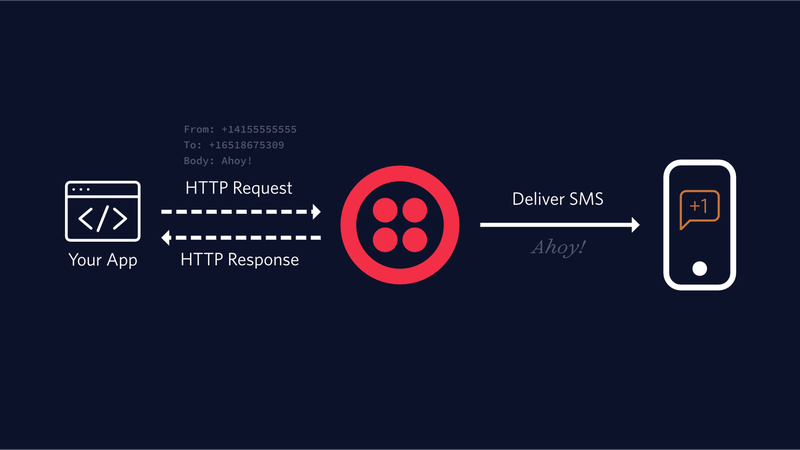 See just how easy it is to send your first SMS Notification with Twilio through our SMS API.